India and Nepal are probably the closest neighbors in world who share huge similarities, though there is so much common between them but they tend to have difficulties in resolving many vital issues. One of the biggest acerbities between two is the issue of revision or modification of 1950 Treaty of Peace and Friendship. Critics call the terms of the treaty overly beneficial for India and lacking sufficient safeguards for Nepal. After the Democratic transition in Nepal the demand for revision of treaty has got momentum. 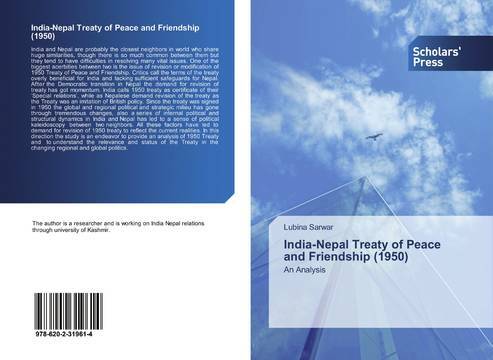 India calls 1950 treaty as certificate of their ‘Special relations’, while as Nepalese demand revision of the treaty as the Treaty was an imitation of British policy. Since the treaty was signed in 1950 the global and regional political and strategic milieu has gone through tremendous changes, also a series of internal political and structural dynamics in India and Nepal has led to a sense of political kaleidoscopy between two neighbors. All these factors have led to demand for revision of 1950 treaty to reflect the current realities. In this direction the study is an endeavor to provide an analysis of 1950 Treaty and to understand the relevance and status of the Treaty in the changing regional and global politics.